Despite widespread damage resulting from the earthquake and tsunami which struck Japan Friday, authorities’ response was prompt and managed to avert a more serious course of disaster, says Dmitry Strochak from the International Seismological Center. ­Strochak insists that the prediction of earthquakes is still an area that requires much research to become reliable, and Japan’s objective was not so much to predict the disaster as to be able to withstand it. Meanwhile, head of Russia's Space Agency, Anatoly Perminov, suggested that a monitoring system which collects data from satellites could in the future predict disasters such as the tsunami in Japan. ­Meanwhile, the Director of the Australian Seismological Center, Kevin McCue, says that there are more earthquakes to happen, but in the Pacific there is no information which allows for predicting exactly when it is going to occur. He says, though, that the region is well-prepared for it. “People [in the region] are fairly well-prepared. Now I think after the 1923 earthquake the Japanese government put a lot of money and a lot of people into studying earthquakes. I think the tsunami has done most of the damage and at the moment there is no way to put out warning of the tsunami when they occur so close to the cost,” McCue said. ­There are always earthquakes in Japan says Dr. Robert Jacobs, a research associate professor of nuclear history and culture at Hiroshima Peace Institute, but even being well-equipped with different kind of systems, people should understand that they do not protect them 100 per cent. “There are also very significant efforts in Japan to try to predict the earthquakes, which are of course a business, but one of the facts which it ultimately points to is that these are human systems and they are designed up to the certain level. I am not positive, since I am not studying nuclear power plants specifically, I am not positive of the kind of earthquakes these plants were designed to handle, but certainly Japan has to anticipate an earthquake over 8 points is possible,” he said. ­Japan is always ready for earthquakes, because the ground there shakes almost every month, says Samuel Akopyan from the Center of Earthquake Forecasting. “There are earthquake and tsunami warning systems in place in Japan. It shuts down transport systems and nuclear power stations to prevent catastrophes. But earthquakes such as this are especially dangerous, because they give off all the pent-up energy that’s been accumulating for years and they take place across very large areas,” said Akopyan. ­Eyewitnesses Yoshihiro Hino and Kazuyuki Sasaki from Meiji University in Tokyo shared with RT what they felt when the devastating earthquake struck: “We attended a meeting when a huge earthquake came to Tokyo, it continued for a long while. We were afraid, there was panic” said Hino. “But the authorities so far are reacting properly” added Sasaki. ­Earthquakes like this often happen in series, so there may be more of them to come, says James Jackson, professor of Tectonics Activity at Cambridge University. “The plate boundaries of the sort that moved in Japan just now and in Sumatra in 2004 do tend to sort of unzip. So once you had one, you have others along. The Sumatra one that started in 2004 over the last six years had three of four other ones, not as quite big as that first one, but getting on,” he explained. 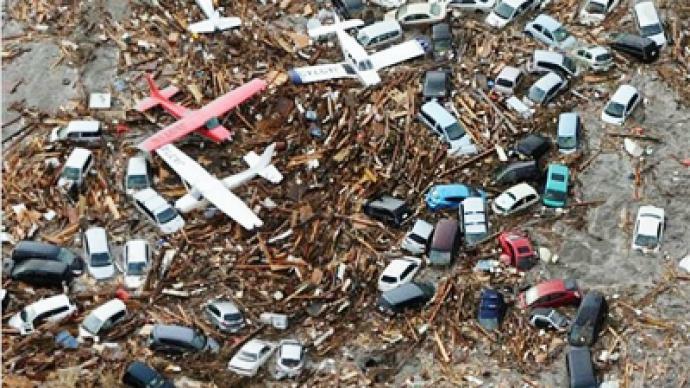 ­Whenever a disaster like that happens, everyone wants to see what more can be done to avoid many casualties, but actually earthquakes are very hard to forecast, claims Vasily Titov from the US Center for Tsunami Research. “We’re developing tsunami forecasting as part of an efficient tsunami warning system, but the other very important part is how to distribute this information to the public. And it’s a very difficult task, especially for the case like in Japan. 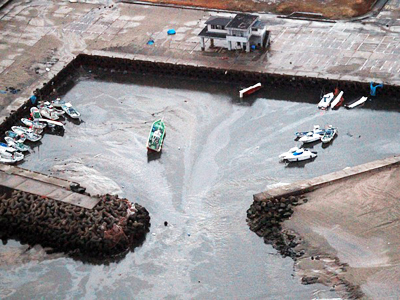 Tsunami waves are probably hitting Japan about 15-20 minutes after earthquakes, which was the only natural warning for these people on the nearest coast,” said Titov. ­Yong Wei from the U.S. Tsunami Research Center told RT that the early alert system worked really well. “With this system we could save lots of lives, the forecasts were very accurate,” said Mr Way.